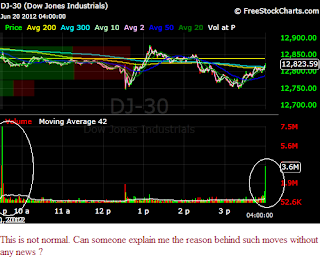 It was one of those confusing day when one could easily lose money whether one's bull or bear in this market. 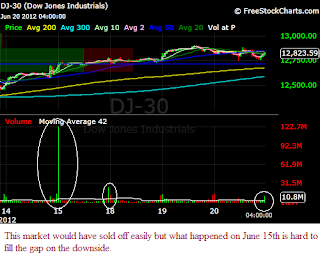 With no QE3, the whole market sold off. Dow was down 100 point in no time. One would have thought that, this market would give up all the gains it made, since last week over hyped central banker and fed qe3 rumor, which none of them happened. 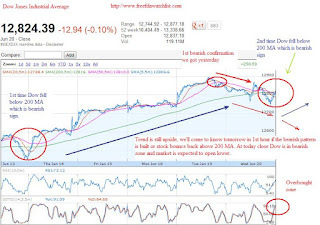 But, Dow soon recovered all the loss and gained 120 from its bottom, trapping all the bears and it looked as if market would rally till the close. 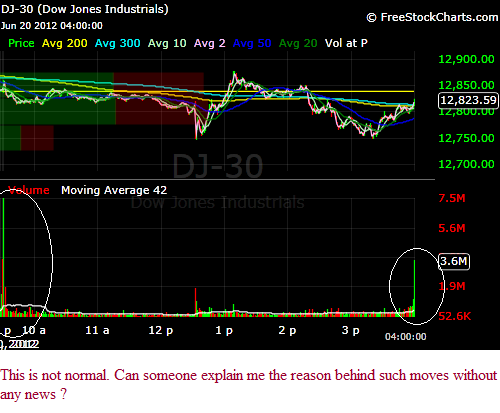 After trapping the bear, it was the turn of bulls to get trapped. Dow sold off 120 point after fed speech. 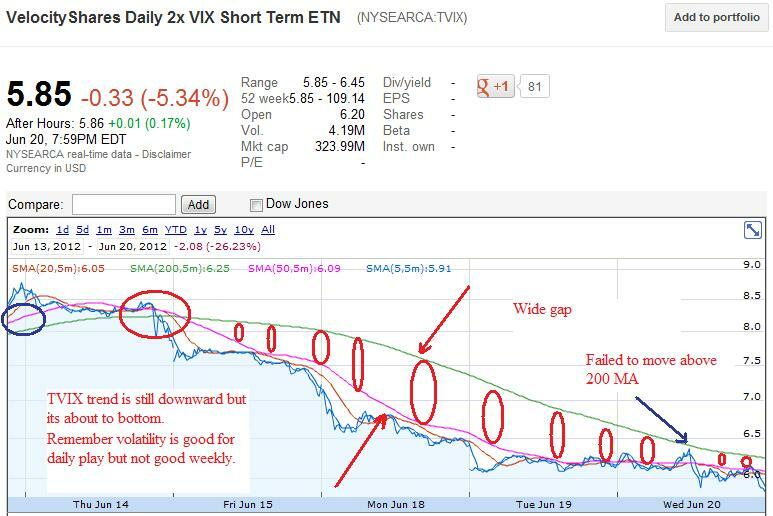 It looked as if the market will give up its gains again. Many shorted but it was adouble trap for bears. 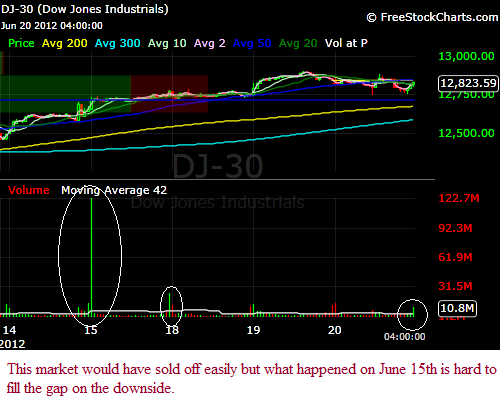 At the close Dow rallied up 75 point and covered 365 point in the whole. 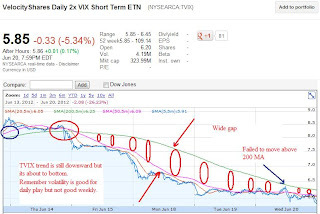 "Remember this market likes to go in opposite direction of what majority thinks. Since most of them shorted this market after no QE3, this market had to rally up or else who will make money if there are all sellers. Market is made up of buyers and seller". This is Casino stock market no matter which side you take you will lose money. I am still bearish for gold and silver unless ECB prints money. Now the focus will shift to Europe for easing as Spanish 10 year yield is close to 7 and earning season of next quarter. 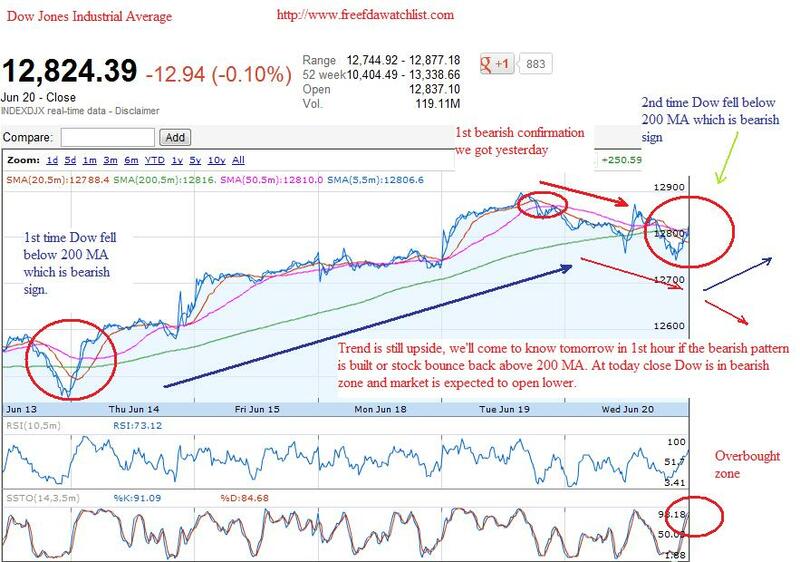 For Bullish sentiment to continue: Dow needs to break 12834, followed by 12865 while S&P500 needs to break 1359. 1. EUR- Euro-zone Manufacturing and Services PMI- Purchasing Managers Indexes, two leading indicators of economic conditions measuring activity in the manufacturing and services sectors, Thurs., Jun. 21, 4:00 am, ET. More signs of a slowdown in the Euro-zone could come with the consensus forecasts pointing to another month of contraction in the manufacturing and services sectors. The preliminary estimate is expected to show the manufacturing index declining to 44.9 in June from 45.1in May, while the services index also inches lower to 46.5 from 46.7. 2. USD- U.S. Existing Home Sales, the main gauge of the condition of the U.S. housing market measuring the number of closed sales of previously constructed homes, condominiums and co-ops, Thurs., Jun. 21, 10:00 am, ET. In line with the trend of U.S. economic slowdown in recent months, sales of previously-owned homes are forecast to decline to 4.59 million in May compared with 4.62 million in May.